I'm a local historian, and every day I check Ebay for new listings of Rochester, NY. I look for postcards which make the late 19th or early 20th century in Rochester come alive, and documents which might tell me something I didn’t know about my relatives, the Dossenbachs. I do this every morning, much like my parents used to read the newspaper every morning. I suppose this is the way I get my news, but my news is often 100 years old. 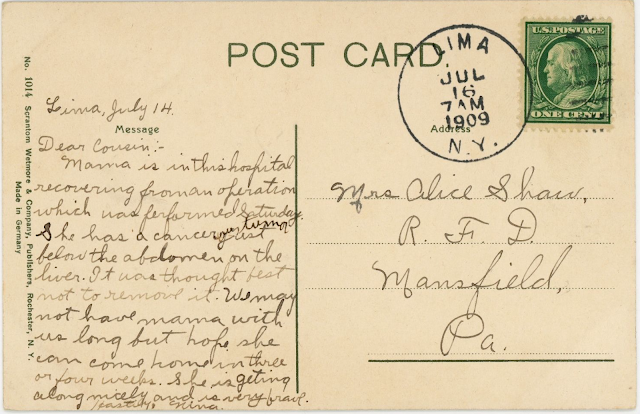 As always, I checked the back of the postcard for a postmark, and read this sad writing from Nina in Lima, NY, to her cousin, Mrs. Alice Shaw, in Mansfield, PA.
Reading this, I am stopped in my tracks. I feel Nina’s sorrow. I wonder about Mama — how long did she live? Well, I’m alive in the year 2017, and during the course of my lifetime, I’ve witnessed the growth of this thing called the Internet, offering the opportunity to know things — almost anything. And I love it. I wonder for a bit — should I divert my attention from my Dossenbachs and find out more about Nina and Mama? Is it even possible? Over to Ancestry where I look up cousin Alice Shaw in 1909 in Mansfield. Of course, there are many Alice Shaw’s. Eliminate those whose birth dates are incompatible, then click on a possible source, discover her maiden name and then her parents’ names, and then her parents’ siblings. One of these siblings, Alice’s aunts and uncles, is Nina’s mother or father. And here’s how one learns a little bit about life in the mid-1800s. Alice’s mother’s oldest brother, Wilford, died in 1861, at age 22, of “army fever,” and then the next oldest brother, Charles, died in 1864, at age 13, of tuberculosis. Those who were alive in the mid-1800s knew much about death. 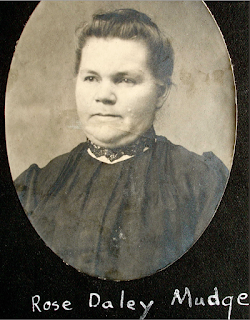 Daughter Nina was born in 1885, so she was only 25 years old when mama died. Mama was 57. 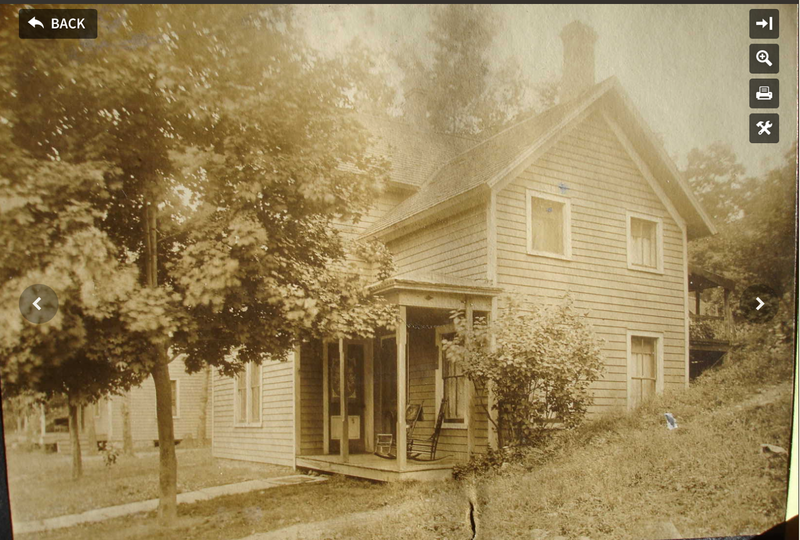 This is Rose’s home, the Mudge home, near Mansfield, PA.
Rose and her husband, Clint, first lived in Pennsylvania, where they had three children. The 1900 federal census tells us that Clint was a clergyman, but in censuses before and after, Clint is a farmer. 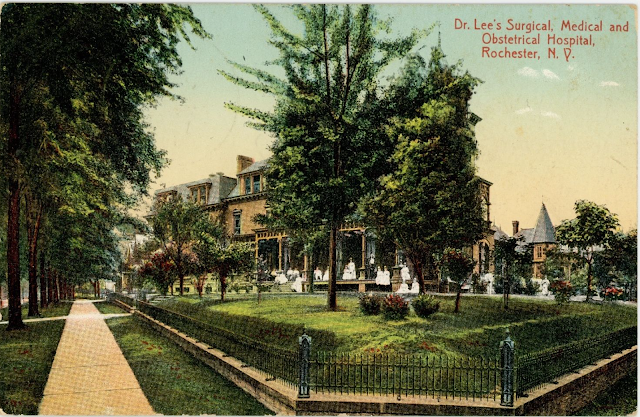 By 1900, they are living in Lima, NY, where Rose passed away in 1910, but at some point after she died, Clint returned to Pennsylvania, where he lived a long life, passing away in 1942 at the age of 91. Rose and Clint’s daughter, Nina — our postcard writer, who knew in 1909, when she was 24 years old, that her mama wouldn’t be around very long — also lived a long life, passing away in 1993 at the age of 108! Nina appears not to have had children, but married twice, first to an Englishman, named Raymond Dinan, no apparent record what happened to him, and then to Floyd Sills, who died in 1960. 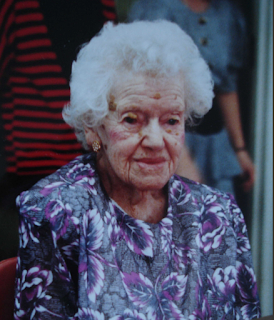 Nina outlived all of them — her mother, father, two husbands, and two brothers. Here is Nina at age 106. She was blind at this time, but played the piano every day and recited a poem that she had learned at 12 years old. Why do we care about people we never knew, people who we are not related to? Why do they matter? Well, because they wrote words, and those words lasted over time, and came to us. They were here once, on this very earth, where we are today as we read this brief history of their lives. Their voices resounded; their tears fell; their lives came and went. As will mine. And yours. And much that we know will also pass. The things we leave behind will tell our stories. And perhaps someone will think about us someday. My sister Krys Holmes and I spent a week or so in about 1991 interviewing Nina. We have hours of tape of Nina talking about all 106 years of her life (at that point). Tim, I so much enjoyed this audio tape. How lovely to hear Nina's voice? And to hear her nudge for us to remember the past, which we have done. It seems both remarkable, and a little unbelievable, and a lot wonderful that we can all connect like this, via the world internet! My earlier comment I guess didn't get published in which I thanked you, Lisa, profusely, for calling my attention to this post card and for writing such a touching post. It is indeed written by my great aunt Nina, writing about her mother Rose, who then died about 2 months later. I think the reason that we grow so attached to people we've never met is that we suspect that they also feel similar joys, griefs and unutterable passions for life, though they are expressed in ways that come across as strange to us. Like their dour expressions in photos are probably just an attempt to look dignified for the camera. I look at Nina's lovely pictures from her youth and see nothing of the delight and spry humor I experienced in her as a centinarian! Thanks again for your post, Lisa, and for the good work you do! Please keep it up! Thank you, Tim. Photographs from the past mesmerize me. I think it's because of the nature of them -- for that split second those people are frozen in time. But in their real life, as soon as the photo was taken, they moved about and went on with their day, living in their time period and place. And when I look at a photo, I want to imagine that, keep going with them, hop on a horse and carriage . . .
You ask why we care about people we never knew, people who we are not related to. I think it's probably also because we seek connections, and find, often enough to surprise us, that we ARE related-- or at least connected. For example like my brother Tim who replied to you last week I am Nina's great-nephew. But also now there's this woman named Lisa in Rochester, NY who has a little bit of my family in her heart. And I feel oddly connected to you. Just a little, but so. I think we seek those connections, and treasure them. We care about strangers because of the deeply human energy of love and hope. Thanks for making the connection! Hello Steve! And hello to Nina's great-nephew! Sorry for my delay in responding; I was visiting my first grandson -- want to make sure that he knows me well, and so can have a personal connection from me into his own past. And I'm thrilled to now have a personal connection into your past. Wasn't it nice for Nina to have written that postcard so long ago? If she could only have known that it would last, and still be meaningful, and, in addition, that it would connect strangers in the present to peoples long gone in the past? Life is surely grand. Glad to know you! It will be up until Aug 29th. Good luck!